Sodium-ion batteries (SIB) are hot candidates for a cheap and sustainable battery technology, but a recurring issue is anode instability. 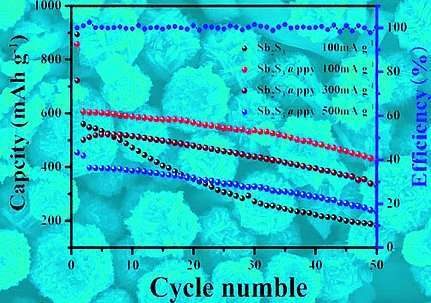 A Chinese team of scientists now reports the preparation of a submicron-size structured anode composite material that can accommodate large volume changes. The antimony sulfide electrode is easily prepared and exhibits superior capacity and cycling performance, as shown in a study published in the European Journal of Inorganic Chemistry. In contrast to lithium ion batteries (LIBs), sodium ion batteries rely on readily available and sustainable raw materials. One of the main reasons why SIBs are not yet widely applied is instability: The large sodium ion cannot integrate as easily in the electrodes as the small lithium ion, causing significant expansion and shrinkage of the structures during the discharging/charging events. This problem particularly refers to the anode, which simply pulverizes during longer cycling periods. Only if this issue becomes solved, a truly working sodium ion battery can be developed. Now, Guangda Li and his colleagues at Qilu University of Technology, Jinan, China, have combined micro- and nanostructured materials with state-of-the-art battery chemistry. They assembled an anode composite material that, through its flower-like submicrostructure, can mitigate the drastic volume changes while still showing improved conductivity and capacity. Moreover, it was easily prepared, the scientists reported. Antimony, or, even better, antimony sulfide, are attractive anode materials for SIBs. Their very high theoretical specific capacities result from the count of as much as three sodium atoms per antimony to be incorporated in the structure upon discharging (which in battery terms is sodiation), when the antimony sulfide first forms sodium sulfide and then antimony alloys. To reduce the effects of the large volume changes, microstructuring to a size between nano- and bulk materials has been proposed. In this regard, the Jinan scientists prepared spherical particles of antimony sulfide having two to three microns in diameter. A closer look revealed that the surface was composed of numerous thin sheets grown together to construct flowerlike structure. This "bunch of flowers" might serve as an effective buffer against volume changes, but its conductivity and diffusion paths are still too low for battery applications. Therefore, the authors coated it with a carbon layer made of polypyrrole polymer. "The PPy coating layers not only serve as the structural stabilizer [...], but can also enhance the conducting of antimony sulfide submicrospheres," they explained. The final composite material had a well-defined shape and met the technical demands of a high-performance anode. The authors also emphasized that their preparation method was a straightforward sol–gel technology starting from antimony acetate (which leaves no harmful chloride in the end product) in combination with a smoothly proceeding polymerization/coating step. This work signifies the recent advances made on sodium ion battery technology. It shows that the combination of nanoengineering strategies with battery electrochemistry may lead to products that can complement or substitute current lithium-ion technology.